I never had much experience with Chinese cabbage until we joined a CSA eight years ago. Come to think of it, I’m not sure I’d even seen a Chinese cabbage until then. I don’t think I was alone. The Chinese are said to have been growing this delicious crop for nearly 2,000 years, but in Maine it’s still a fairly new kid on the block. I bet it is where you live, too. Our very own Johnny’s Selected Seeds, located in Winslow, Maine, calls Chinese cabbage “an Asian specialty that combines the thin crisp texture of lettuce with the fresh peppery tang of juicy cabbage.” That’s a spot-on description. This vegetable is easy to grow, high yielding, tolerates both hot and cool weather, has a long season, and keeps well. Translation? It’s an ideal crop for a CSA. When those tall, loose columns of crunchy pale green-ness started appearing regularly in our first CSA pick-ups back in 2005, I knew I’d have to get onboard with this vegetable, and fast. I’m so glad I did. Although a bit of a mystery to us at first, Chinese cabbage quickly became a staple. Our favorite way to use it is in this quick and easy salad, which we probably eat at least once a week from early spring well into the fall. This is Chinese cabbage at its best, I think: fresh, crisp, moist, and just plain delicious. I’m a little embarrassed to tell you that my husband and I regularly eat this entire salad at one sitting—but yes, it is our entire meal! This recipe is adapted from one on our CSA’s website. You can find the original here. This version serves 4–6 as a side dish, or 2 super-enthusiasts who are making a meal of it. Toast the sesame seeds and let them cool a minute or two. 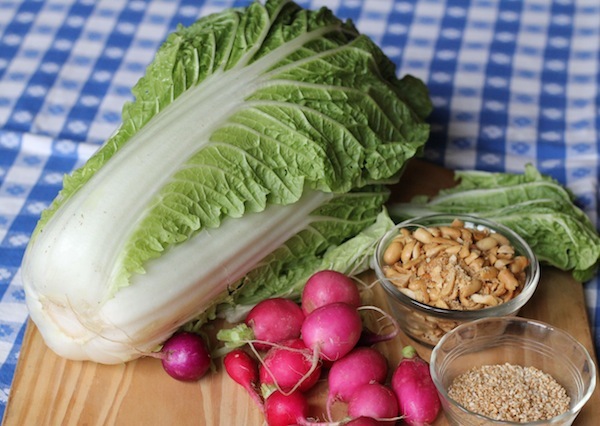 Combine cabbage, radishes, nuts, and sesame seeds in a large bowl. Mix the remaining ingredients and toss with the veggies a little at a time. Add only enough dressing to suit your taste. This salad is best when eaten right away; the leftovers tend to get soggy. Hooray! Another salad lover! I fix a salad almost every day for one of our meals - just salad - a big plate each. I'm always looking for new combinations so this is great. 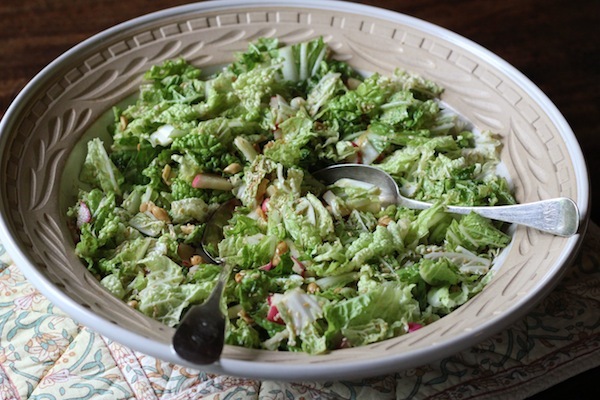 I usually do some take on cabbage salad - good for us and not too pricey. Thanks for the recipe. I was wondering if I could make the dressing up ahead of time. I am trying to do as much ahead of time as I can prior to weekend company.